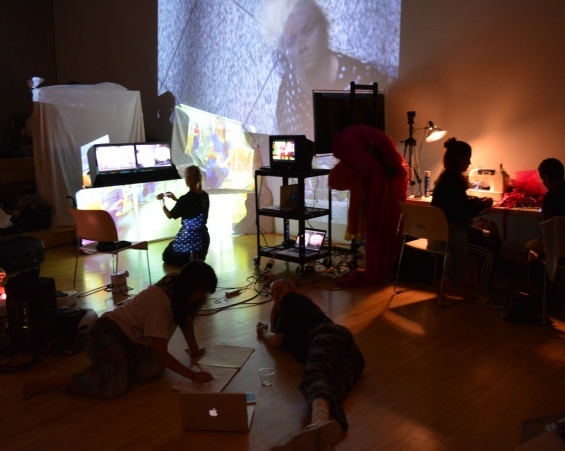 AUNTS is a community-building apparatus for organizing simultaneous performance and art activities in a shared space. This fall the New Museum, by invitation from the Stedelijk Museum and Trouw (a nightclub and arts space in Amsterdam), is organizing a special international dance-for-camera edition of AUNTS as part of the “Trouw Invites…” exhibition series. Tonight’s event, BYOC! (Bring Your Own Camera!—Where the Audience Controls the Frame), coincides with the opening night party for the “AUNTSforcamera” exhibition at Trouw in Amsterdam and will be Livestreamed into the dance/art/club space at Trouw. Fifteen artists, including “AUNTSforcamera” participating artists, will create a live AUNTS event, offering a selection of short, long, and durational performances, arranged and coupled in different unrehearsed combinations. Visitors are free to move through BYOC!, engaging with as many or as few of its offerings as they like, choosing their own path through the event and creating their own experiences through chance encounters. Throughout the event, visitors will be encouraged to film the performances via a Livestream camera set up with 360-degree perspective in the middle of the New Museum Theater. Visitors are also encouraged to record and upload eight-second videos of the event via a unique dance-for-camera social media application designed by Karl Scholz, one of the participating artists in “AUNTSforcamera.” By hashtagging eight-second clips to “#auntsforcamera”, visitor- and artist-produced videos will automatically become part of the footage exhibited in the “AUNTSforcamera” installation at Trouw and, later, the New Museum. The last two hours, 7–9 p.m., will segue seamlessly into a dance party. “AUNTSforcamera” unfolds publicly through an open-studio production week (September 10–14, 2014), shared simultaneously by all participating artists and resulting in new dance-for-camera works that will be exhibited as an immersive moving image installation at Trouw (November 6–30, 2014) and, later, the New Museum (including new material produced with artists and audiences at Trouw). The individual works produced through this project uniquely engage the relationship between dance and moving-image media, both in terms of their creation as part of a shared open-studio process and their subsequent presentation as part of an AUNTS-organized moving-image installation. Here, AUNTS is utilized as an apparatus to interrogate, and occasionally undermine, the systems of autonomous control that characterize visual framing and the construction of time and space within moving-image production and display. Participating AUNTS artists include: Cara Francis, IMMA/MESS, Vanessa Justice, Anya Liftig, Karl Scholz, Larissa Velez-Jackson, Gillian Walsh, Collective Settlement (Felicia Ballos, Jean Brennan, and Charnan Lewis), and collaborators Salome Asega, Chrybaby Cozie, and Ali Rosa-Salas.